Our Splash Shields for the Front Fender area on 65-66 and 67-68 Mustangs have always been extremely popular items. 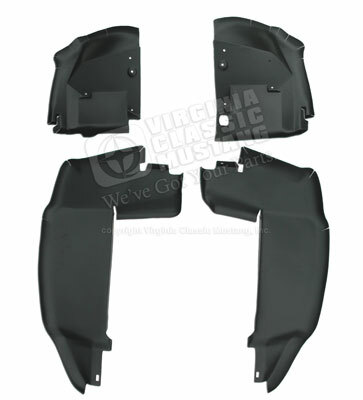 We have also had numerous requests for Splash Shields for the 69-70 Mustang models. In 1969 and 1970 Ford went to plastic splash shields rather than using the old metal ones with rubber as found on the 65-68 Mustangs. We now have these plastic splash shields available for your 69-70 Mustang. They are sold as a set of 4. Order part number SM851.